WALLDORF, Germany, July 19, 2018 /PRNewswire/ -- SAP SE (SAPGF) (NYSE: SAP) today announced its financial results for the second quarter ended June 30, 2018. New cloud bookings1 grew 24% (29% at constant currencies) in the second quarter and reached €421 million. Cloud subscriptions and support revenue grew 30% year over year to €1.21 billion (IFRS), up 40% (non-IFRS at constant currencies).2 Software revenue was down 9% year over year to €996 million (IFRS), down 5% (non-IFRS at constant currencies). New cloud and software license order entry3 grew 12% at constant currencies year over year in the second quarter. Cloud and software revenue grew 4% year over year to €4.94 billion (IFRS), up 10% (non-IFRS at constant currencies). Total revenue grew 4% year over year to €6.00 billion (IFRS), up 10% (non-IFRS at constant currencies). SAP's rapidly expanding cloud business together with solid growth in support revenue continued to drive the share of more predictable revenue. The total of cloud subscriptions & support revenue and software support revenue as a percentage of total revenue grew 2 percentage points year-over-year to 66% in the second quarter. Second quarter operating profit was up 13% year over year to €1.04 billion (IFRS), up 12% (non-IFRS at constant currencies). As announced in January 2018, the Company expects a positive revenue and profit impact from the adoption of IFRS 15 in 2018. In the second quarter, this positive impact on SAP's operating profit was around €54 million. Earnings per share increased 8% to €0.60 (IFRS) and increased 5% to €0.98 (non-IFRS). Operating cash flow for the first six months was €2.99 billion, down 15% year over year. The decrease in operating cash flow was mainly due to timing of stock based compensation payments, currency headwinds as well as higher tax and insurance payments. Free cash flow decreased 25% year over year to €2.17 billion. Free cash flow was also lower due to the previously announced additional CapEx for 2018. At the end of the second quarter, net liquidity was -€2.97 billion. With SAP's next generation ERP S/4HANA, customers can massively simplify their IT landscape, turn real-time data into actions and reinvent their business models for the digital economy across every industry. S/4HANA adoption grew to more than 8,900 customers, up 41% year over year. In the second quarter, approximately 600 additional customers signed up of which approximately 40% were net new. S/4HANA continues to be selected by world-class global companies, including McDonalds (China) in the quarter. A growing number of companies are now adopting S/4HANA in the Cloud. TechnipFMC, China Sports Lemon, and Spirit Airlines chose S/4HANA Cloud. SAP's C/4HANA solutions serve a wide range of industries across both B2C and B2B and enable businesses to manage their entire front office: marketing, sales, commerce, service, customer data cloud – seamlessly and in real-time. In the second quarter, SAP's C/4HANA customer experience solutions achieved high double-digit year-over-year growth in new cloud bookings and total revenue in the SAP Customer Experience segment was up 65% to €242 million at constant currencies. Whirlpool, Deutsche Telekom, and Novartis were among those that chose SAP's C/4HANA solutions this quarter. With SAP SuccessFactors and SAP Fieldglass, SAP delivers total workforce management across both permanent and contingent labor. The SAP SuccessFactors suite is localized for 92 countries and 42 languages. SAP SuccessFactors Employee Central, which is the flagship of SAP's HCM offering, ended the quarter with more than 2,600 customers and scored numerous competitive wins including BMW, Telecom Argentina, Shiseido, and MG Motors India. With SAP Leonardo SAP delivers powerful innovation by bringing together deep process and industry expertise, advanced design thinking methodology and cutting edge software capabilities such as IoT, Big Data, Machine Learning, Analytics, and Blockchain. All of this is integrated on the SAP Cloud Platform with new technologies easily added as they emerge. Toyota (TM) and Porsche are among many others that adopted SAP Leonardo solutions in the second quarter. With the SAP Business Networks SAP provides collaborative commerce capabilities (Ariba), flexible workforce management (Fieldglass) and effortless travel and expense processing (Concur). SAP Business Network is the largest commerce platform in the world with approximately $2.4 trillion4 in global commerce annually transacted in more than 180 countries. In the second quarter, total revenue in the SAP Business Network segment was up 21% to €688 million at constant currencies year over year. Bosch-Siemens Hausgeräte, and Avianca chose SAP's Business Network Solutions in the second quarter. 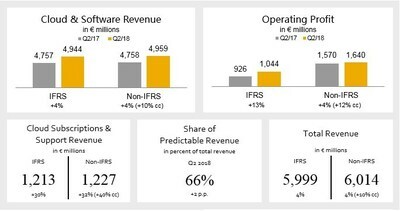 SAP had a very strong performance in the EMEA region with cloud and software revenue increasing 10% (IFRS) and 12% (non-IFRS at constant currencies). Cloud subscriptions and support revenue was strong and grew by 40% (IFRS) and 46% (non-IFRS at constant currencies) with Germany and the UK being highlights. In addition, SAP had strong double-digit software revenue growth in the UK, and the Middle East and Germany had another strong software revenue quarter with solid single digit growth. The Company had a solid performance in the Americas region with a significant currency headwind. Cloud and software revenue decreased by 3% (IFRS) and increased by 8% (non-IFRS at constant currencies). Cloud subscriptions and support revenue increased by 24% (IFRS) and 35% (non-IFRS at constant currencies) with Brazil being a highlight. In the APJ region, SAP had a strong performance. Cloud and software revenue was up by 4% (IFRS) and grew by 11% (non-IFRS at constant currencies). Cloud subscriptions and support revenue was exceptional and grew by 42% (IFRS) and 52% (non-IFRS at constant currencies) with China and Japan being highlights. For software revenue, Australia, China and India had impressive quarters and grew by double digits. 2) For a detailed description of SAP's non-IFRS measures see Explanation of Non-IFRS Measures online. For a breakdown of the individual adjustments see table "Non-IFRS Adjustments by Functional Areas" in this Quarterly Statement. 3) As this is an order entry metric, there is no IFRS equivalent. Non-IFRS cloud subscriptions and support revenue is now expected to be in a range of €5.050 billion − €5.200 billion at constant currencies (2017: €3.77 billion), up 34.0% – 38.0% at constant currencies. The previous range was €4.95 billion − €5.15 billion at constant currencies. Non-IFRS cloud and software revenue is now expected to be in a range of €21.025 – €21.250 billion at constant currencies (2017: €19.55 billion), up 7.5% – 8.5% at constant currencies. The previous range was €20.85 – €21.25 billion at constant currencies. Non-IFRS total revenue is now expected to be in a range of €24.975 billion − €25.300 billion at constant currencies (2017: €23.46 billion), up 6.0% – 7.5% at constant currencies. The previous range was €24.80 billion − €25.30 billion at constant currencies. Non-IFRS operating profit is now expected to be in a range of €7.400 billion − €7.500 billion at constant currencies (2017: €6.77 billion), up 9.0% – 11.0% at constant currencies. The previous range was €7.35 billion − €7.50 billion at constant currencies. While SAP's full-year 2018 business outlook is at constant currencies, actual currency reported figures are expected to be impacted by currency exchange rate fluctuations as the Company progresses through the year. See the table below for the Q3 and FY 2018 expected currency impacts. As of January 1, 2018, SAP changed several of its accounting policies to adopt IFRS 15 'Revenue from Contracts with Customers'. Under the IFRS 15 adoption method chosen by SAP prior years are not restated to conform to the new policies. Consequently, the year-over-year growth of revenue and profit in 2018 will be impacted by the new policies. The new revenue recognition policies are described in our Half Year Report. Details regarding the IFRS 15 impact in the second quarter and first six months can be found in the section 'Impact of Changes in Accounting Policies' in this Quarterly Statement. Looking beyond 2018, SAP is updating its 2020 ambition. This update reflects the strong momentum in SAP's cloud business, the acquisition of Callidus Software (CALD) as well as a more challenging currency environment compared to 2017. SAP now expects 2020 non-IFRS cloud subscriptions and support revenue in a range of €8.2 − €8.7 billion (previously: €8.0 – €8.5 billion). The updated ambition is based on estimated average 2018 currencies, assuming the current foreign exchange environment prevails until year-end. The previous ambition was based on average 2017 currencies. The change in currency assumptions negatively impacts the cloud subscriptions and support revenue ambition by approximately -€0.35 billion, the total revenue ambition by approximately -€1.0 billion and the operating profit ambition by approximately -€0.4 billion. These negative impacts are now included in the updated 2020 ambition. On April 5, 2018, SAP acquired Callidus Software Inc. and changed the structure of the Applications, Technology & Services segment. The Callidus business was combined with our existing customer experience activities into a new business unit called 'SAP Customer Experience'. This new unit, which qualifies as an operating segment (called 'Customer Experience'), comprises on premise and cloud-based products that run front office functions across the customer experience. The company has retrospectively adjusted its revenue and results for the Applications, Technology & Services segment to reflect these changes. For further information regarding changes in SAP's segment structure, see Note 14 in our consolidated Half-Year Report. All numbers for the SAP group and the Customer Experience segment include Callidus revenues and profits from April 5, 2018 onwards. Numbers for periods before the acquisition do not include Callidus' revenues or profits. SAP senior management will host a financial analyst conference call at 2:00 PM (CET) / 1:00 PM (GMT) / 8:00 AM (Eastern) / 5:00 AM (Pacific). The call will be webcast live on the Company's website at www.sap.com/investor and will be available for replay. Supplementary financial information pertaining to the second quarter results can be found at www.sap.com/investor. 2 For the second quarter 2018, Callidus contributed €50 million to SAP's Non-IFRS cloud subscriptions and support revenue at constant currencies. The Callidus acquisition was closed on April 5th 2018. 3 New cloud and software license order entry is the total of new cloud order entry and software license order entry. The new cloud order entry metric is identical to the new cloud bookings metric defined above except that it considers the total contract value (TCV) of the orders where the new cloud bookings metric considers the orders' annualized contract value (ACV). Software license order entry is the total of all orders received in a given period the revenue from which is expected to be classified as software license revenue. The support services commonly sold with the software licenses are not included in the software license order entry metric. 4 SAP Business Network commerce is the total commerce transacted on the Ariba, Concur and Fieldglass Networks in the trailing 12 months. Ariba commerce includes procurement and sourcing spend. Previously we only included the total commerce transacted on the Ariba Network in this metric. 5 "Impact of the accounting policy change" means the difference between a revenue and profit measure determined under SAP's new IFRS 15-based policies and the respective measure as it would stand had our previous accounting policies continued to apply.